Add one more moving part to The Gift of the Magi program that is a defining outreach of St. Mary’s Seminary in Roland Park. Coordinated by the seminarians’ Peace and Justice Committee, the Christmas gift-giving program benefits students from Baltimore’s Mother Seton Academy and children whose families are clients of Project PLASE, which addresses homelessness in Baltimore. The outreach involves not just seminarians, but the campus’s Ecumenical Institute, where the faculty are among those donating gifts. Youths from Our Lady of Perpetual Help in Edgewater joined the effort in 2015, and this year they were accompanied for the first time by teens from Our Lady of Sorrows in West River, the church with which it is forming an Archdiocese of Baltimore pastorate in southern Anne Arundel County. More than 30 youths piled onto a bus at Our Lady of Perpetual Help for an 8:30 a.m. departure for the seminary Dec. 1. That meant a 7 a.m. Saturday morning wake-up for Natalie McDonald, an eighth-grader at Southern Middle School whose family worships at Our Lady of Sorrows, the southernmost parish in the archdiocese. She had never set foot in a seminary, nor wrapped a gift without her mom’s help. “We’re here to make the world a better place,” the 13-year-old said. Joey Murphy, a junior at South River High School who wants to study marine biology in college, was making his fourth trip in as many Decembers to the seminary. The cards he wrote included passages inspired by Scripture, such as “Rejoice.” He’s one of three teens on the core group that has led youth ministry at OLPH. 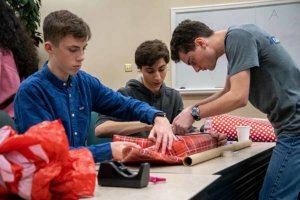 He spoke as McDonald, Murphy and other teens sat alongside seminarians in a lecture hall, wrapping more than 110 presents and personalizing as many Christmas greeting cards.